1) OPEC production cuts with US pullback from Iranian nuclear deal along with US intentions to impose sanction on Iranian crude oil export creates upward pressure on crude oil price. In fact, this pressure was so high that OPEC increased production in order to keep commodity market in balance. 2) Slower economic growth along with trade disputes between US from one side and China, European Union from the other creates downward pressure on crude oil price. Also US intentions to reduce crude oil strategic reserves also put pressure on crude oil price. Crude oil price is also sensitive to economic activity from second largest economy, China. If economic data from China are positive that could also be positive sign for commodity market and vice versa. On short term time frame, inventories report and drilling activity from US could also be a price mover on crude oil. On the daily graph it is noticeable that since the crude oil price touched its peak at 76.88 dollar per barrel level, it has begun to fall. On October 23, the price of crude oil fell to the 65.73 dollar level which was also the bottom of trading channel (black lines on the graph). Since then the price of this commodity started to recover. 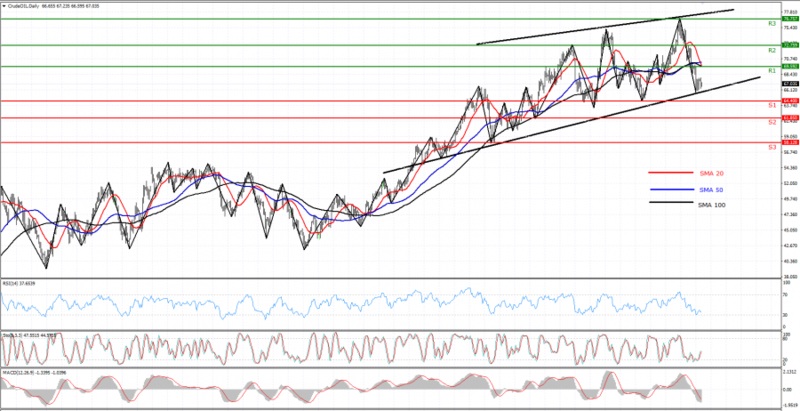 The recovery of crude oil price is also supported by RSI, MACD and Stochastic oscillator which indicate an uptrend. If that trend continues, then the price might test resistance 1 of 69.59 dollars. However, we should bear in mind that price of crude oil is below simple moving averages which is the technical indicator for a downtrend. If downtrend prevails then support 1 of 64.40 could be tested.